I am in LOVE with Indian food! Yes, and this recipe is another one to add to the list of simple & tasty Indian dishes to try. 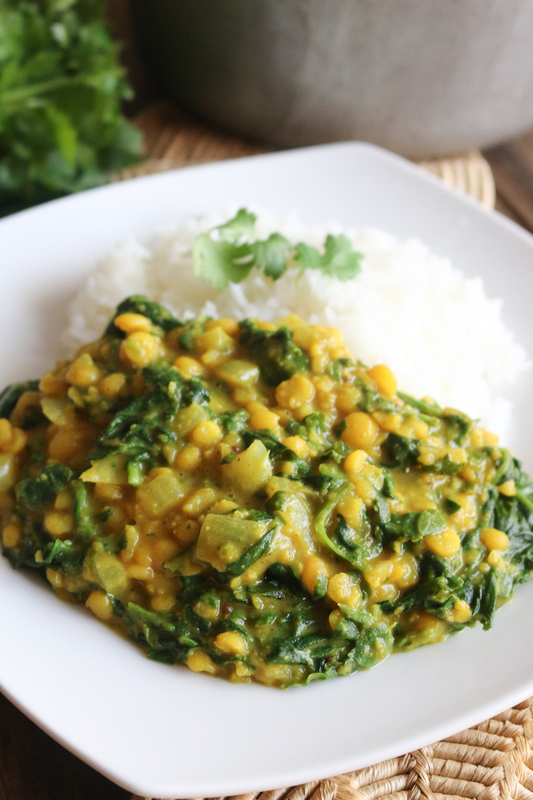 Yellow Split Pea Spinach Dahl, made with warm spices, fresh spinach and yellow split peas. I often make a BIG batch of this recipe on my meal prep days, because you only need one pot and it’s great for a quick lunch or dinner that lasts all week long, even for a family of four, you’re sure to get a few meals out of this 1 dish! 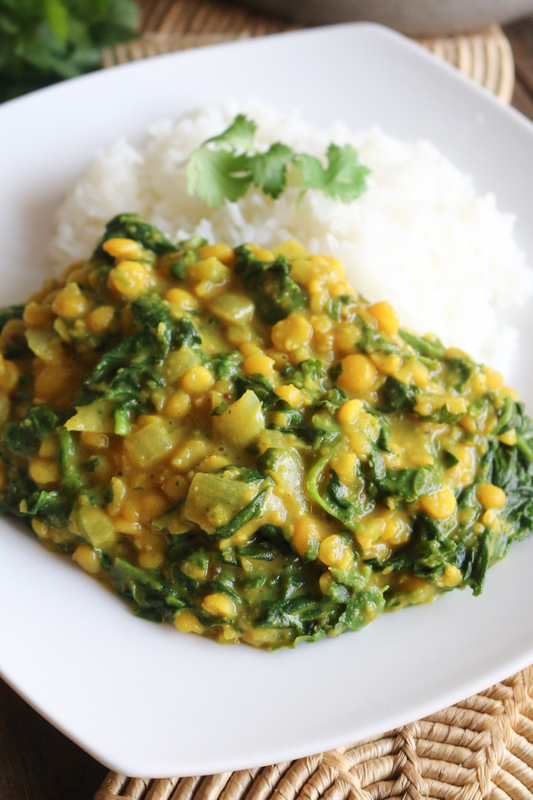 If you’ve ever eaten Indian food, chances are you’ve had some variety of dal (dahl, daal, dhall). 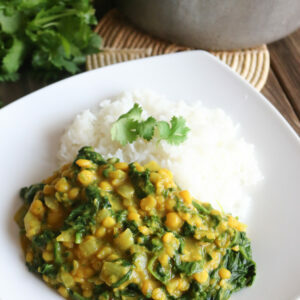 Dahl is a term that refers to legumes (lentils, peas, and beans) that are cooked and spiced with curries, cumin seeds, mustard seeds, turmeric, and garam masala. 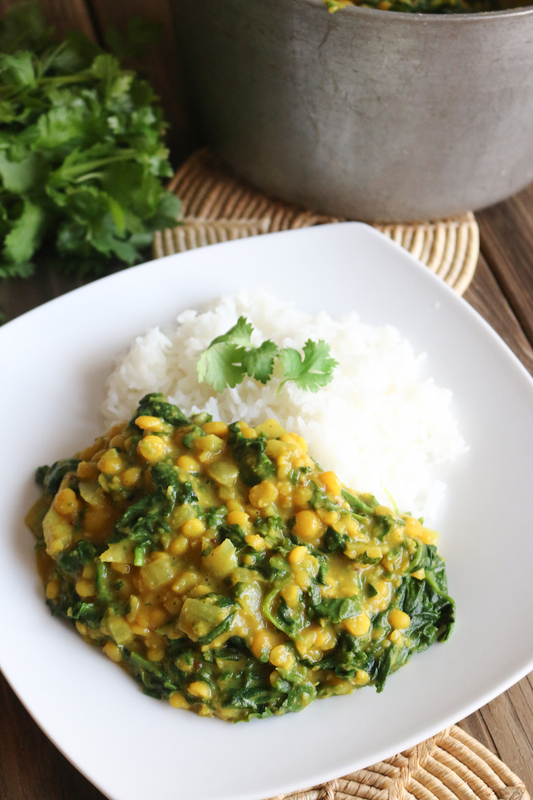 Dal is high in fiber, protein, and taste absolutely delicious. I typically serve a large bowl with a side of quinoa, basmati rice, cauliflower rice or naan. 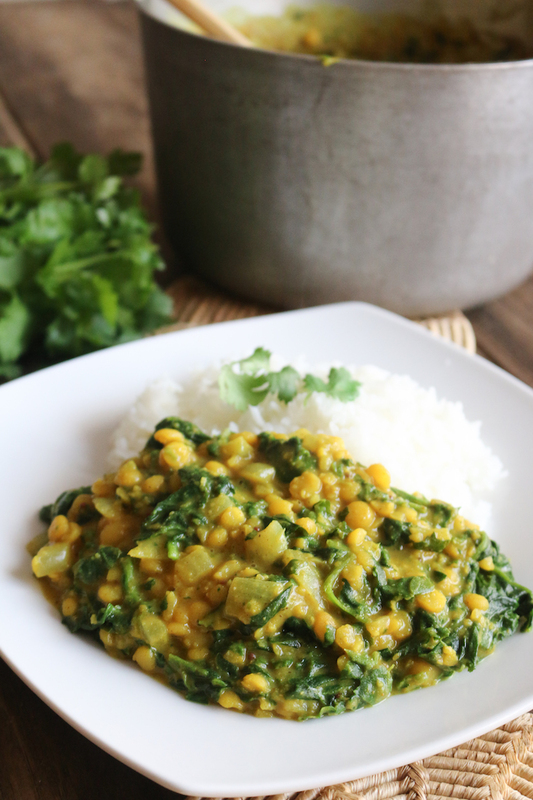 If you loved my last 1-Pot Green Lentil Dal recipe then your sure going to love this one! 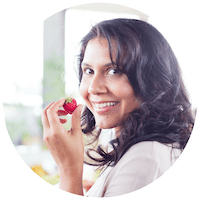 Plus between all of the spices, vegetables, greens and lentils you are getting a TON of nutrients in one serving. It’s the perfect meal for these cold chilly evenings. Which I know some of you are still having. So this is a great opportunity to get cozy and make yourself a warm meal to enjoy. Tadka is a technique used in Indian cuisine which involves heating whole or ground spices in hot oil (or ghee) and then adding it to a dish. The heat is thought to help the spices unlock both favor and their healing properties. Experience has taught me not to use olive oil for the tadka process, as olive oil breaks down at high temperatures, and for a successful tadka, the oil should be very hot. So I recommend neutral oils such as a coconut oil or grapeseed oil. This technique can be done at either the beginning or the end of the cooking process. I chose to prepare this dal and doing the tadka at the end of the recipe but if you like you can totally do it at the beginning. 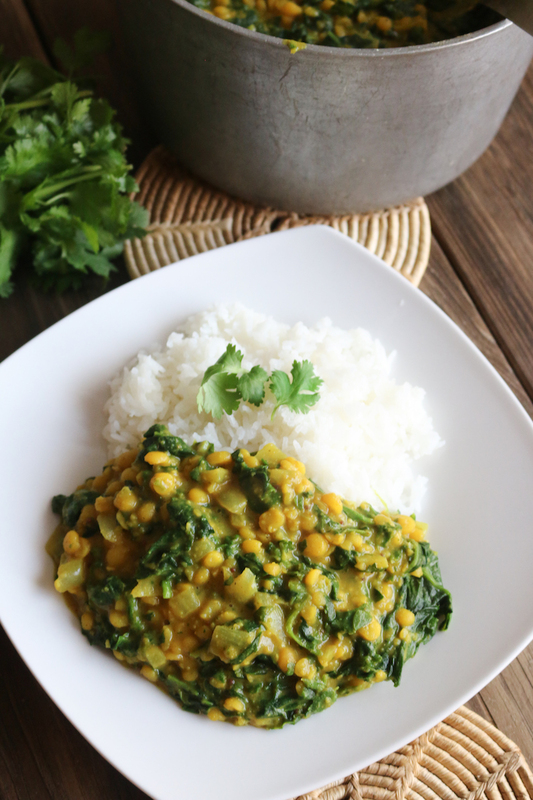 Simple, yellow split pea dal recipe seasoned with fresh spices, garlic, ginger, and swimming in a curried coconut sauce. The perfect plant-based side! Place the yellow split peas in a fine-mesh strainer and rinse thoroughly under cold water. Transfer to a large saucepan, add the measured water, and bring to a boil over high heat. Reduce the heat to medium low and simmer, stirring occasionally and skimming any scum off the surface with a large spoon, until the peas are completely soft and the consistency of split pea soup, about 45 minutes. Remove from the heat and stir in the lemon juice and measured salt; set aside. In a large rimmed skillet, heat oil and sauté onion, garlic, and ginger for 2-3 minutes, stirring frequently. Add the cumin seeds, turmeric, and curry stirring occasionally, until the cumin seeds are toasted and fragrant, about 3 minutes; season with salt; and cook until everything softens, about 2 to 3 minutes. Add the spinach, stirring occasionally, until the spinach is completely wilted, about 4 minutes. Transfer the spinach mixture to the reserved saucepan with the split peas and stir to combine. Serve immediately with steamed rice, cauliflower rice or naan on the side. Enjoy! If you try this recipe, I wanna hear about it, so let’s chat! Leave a comment it, rate it (this helps me improve future recipes), and don’t forget to tag a picture #livesimplynatural to show how you live and try these recipes on Instagram. Stay tune for more plant powered recipes!